With another week of action behind us, and some more fresh stats to analyze, I’m here to help you with your toughest fantasy football start/sit decisions for Week 11 of the NFL season. Notes: If you don’t see one of your players mentioned below, please refer to our rankings. Once we get to the “deep league” section, I no longer offer sit suggestions, because … well, you don’t need me to tell you to sit the No. 45 running back in a week. In Week 10, Johnson played on 71% of Detroit’s snaps while drawing 14 carries and seven targets in a 12-point loss to the Bears. He ranks second among running backs in targets over the past three weeks (19), and that’s an important stat given this week’s matchup. The Lions will likely be forced to lean pass-heavy as 4.0-point underdogs to the Panthers. Given Johnson’s increase in usage to match already good efficiency (fourth-best yards per carry), I’d start him with confidence as a high-end RB2. Hilton’s usage has been odd this season, at least in comparison to years prior, as outlined in Week 10’s Actual Opportunity report. Still, the production has mostly been there, ranking 28th at the position in fantasy points per game. This is despite some tough cornerback matchups that include shadow games against both Tre’Davious White and Jalen Ramsey over his last three games. I’m willing to bump him up a tier or two this week, given the soft matchup against the Titans. Hilton runs the plurality of his routes from Andrew Luck’s left, while Tennessee is giving up the most fantasy points per game to left wide receivers (hello, Malcolm Butler). Tennessee also ranks bottom-10 in schedule-adjusted fantasy points per game to WR1s. Over Tennessee’s past three games, Lewis has played on 74% of the team’s snaps, while seeing 61% of the team’s carries and 75% of the team’s targets out of the backfield. 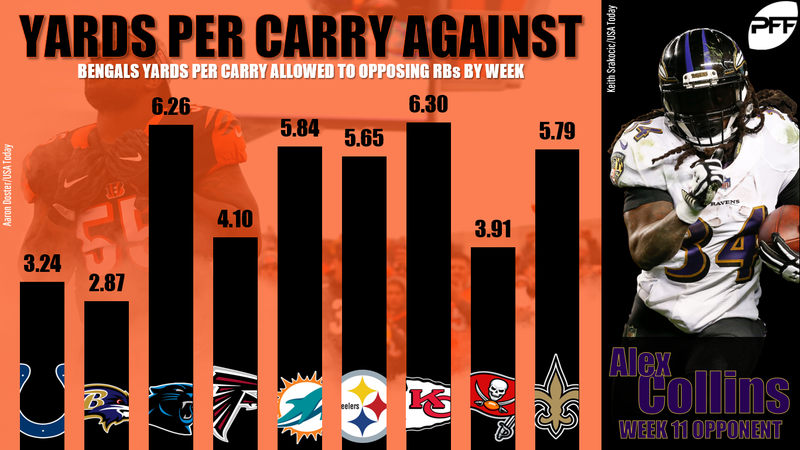 On a per-game basis, over this stretch, he’s seen 17.3 carries and 4.0 targets per game. Although Derrick Henry will still dominate goal-line work, Lewis is now operating as more of a bell cow, in addition to guaranteed work in the passing game. The latter point is important this week, against a Colts defense that is giving up the fourth-most receiving fantasy points per game to enemy running backs. Cohen ranks 16th among running backs in expected fantasy points per game since Week 4. Chicago’s two losses during this span resulted in two of Cohen’s three highest games in terms of expected fantasy points, with most of that coming through the air (19 targets). Given that Minnesota ranks top-six in yards allowed per carry for the second season in a row and the spread is close (Chicago is favored by only 2.5 points), I’m expecting heavy involvement from Cohen this week. For six straight games Wentz has thrown for multiple touchdowns and at least 275 yards. He follows up tough games against Jacksonville and Dallas to face a New Orleans defense that ranks as the league’s top pass-funnel defense (a league-leading 79% of the team’s yardage allowed has come via the pass). New Orleans also ranks bottom-four in fantasy points allowed per game (to quarterbacks), fantasy points allowed per dropback, and opposing passer rating. This year, Peterson averages 17.9 fantasy points per game in victories and 6.8 fantasy points per game in losses. That’s a concern for him this week as 3.0-point underdogs to the Texans, who rank third-best in yards allowed per carry (3.54). 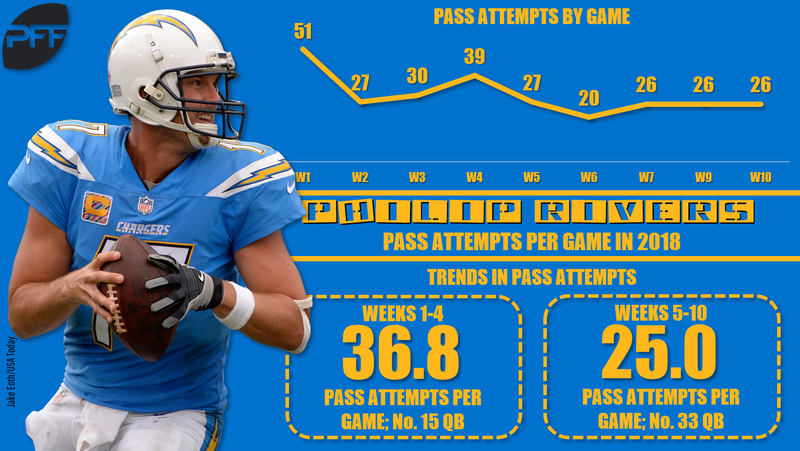 The Chargers have been taking more of a run-heavy approach in recent weeks, ranking dead-last in passing plays per game (26.6) since Week 5. It’s hard to imagine Rivers will have to pass too much this week, as 7.0-point favorites. On top of that, Denver ranks fourth-best in schedule-adjusted fantasy points per game to opposing quarterbacks. He’s just a mid-range QB2 this week. Darius Slay was seen back at practice on Wednesday, which likely means he’ll be shadowing Funchess on Sunday. Funchess has struggled over his last three games and, more specifically, in games Greg Olsen has been active over the past two seasons. He’s an easy fade this week. Robinson had his best game of the year last week, but it came against an ailing Detroit secondary without top cornerback Darius Slay. This week he expects to draw shadow coverage from Xavier Rhodes, who hasn’t allowed a touchdown or a 50-yard game since Week 2, despite six shadow games over that stretch. Among wide receivers, Shepard ranks 30th in both expected and actual fantasy points per game. This season, his two best games have come in his two best matchups – Atlanta and New Orleans were the only teams he’s faced that rank bottom-10 in fantasy points per game to slot wide receivers (Shepard runs 69% of his routes from the slot). Now, he gets the ultimate slot matchup, up against a Tampa Bay defense that is giving up 23.8 fantasy points per game to opposing slot wide receivers, which ranks most in the league. Cooper totals 36.5 expected fantasy points over the last two weeks, ranking fifth-best among all wide receivers. With Oakland, through the first six weeks of the season, Cooper ranked outside of the top-60 wide receivers in expected fantasy points per game. In addition to better usage in Dallas, Cooper has a top matchup this week, against an Atlanta defense that ranks third-worst in schedule-adjusted fantasy points per game to opposing wide receivers. Marvin Jones left last week’s game early due to an injury, and Golladay picked up the slack in his absence. He saw a career-high 13 targets last week, totaling 19.8 fantasy points. With Jones banged up and possibly out for Week 11, Golladay is well worth the start despite another tough matchup. Collins’ usage has been troublingly low this year, in comparison to last year, but it has been slightly better in victories rather than losses. Despite serious usage concerns, he’s worth starting this week as a low-end RB2. The Bengals rank worst in points allowed per drive (3.03), fourth-worst in yards allowed per carry (5.08), and fifth-worst in rushing yards allowed per game (118.4). I expect the Ravens to lean heavy on the run with Joe Flacco banged up and possibly out for Sunday’s game. This game has a 63.5-point over/under, which would make it one of only three games with an over/under of at least 60.0 since 2000. You’re going to want a piece of this game and if you’re not starting Watkins this week, I’m not sure when you would. Three different Eagles running backs played between 18 and 21 snaps in Week 10. I’m not going to try to get cute and pick a winner. I’ll wait for a player to emerge before dipping my toes into these muddy waters. As highlighted here, Humphries has seen terrific usage in recent weeks, but he’s a risky start for Week 11. Humphries runs 84% of his routes from the slot, and the Giants are giving up the fewest fantasy points per game to opposing slot wide receivers. Over his past four games, Smith is averaging just 8.0 carries and 2.8 targets per game, with 0 opportunities inside the 10-yard line. Those numbers mean he’s not worthy of a starting spot in your lineup unless absolutely desperate, and especially not this week in such a tough matchup. Ross found the end zone last week, but I’m still wary. In 126 career routes he totals just nine receptions. Perhaps he continues to produce on an expanded role with A.J. Green out, but I’m not ready to trust him just yet. Over the past four weeks of the season, Manning ranks 16th among quarterbacks in fantasy points per game (18.2). In any other week he’d be a tough sell, but not this week against a borderline historically bad Tampa Bay pass defense. The Buccaneers are surrendering 2.56 passing touchdowns per game with an opposing passer rating of 122.3. Not only are those numbers worst in the league this year, but they’d rank worst by any defense this past decade. If looking for a spot-start at the QB position this week, you can do a lot worse than Manning. 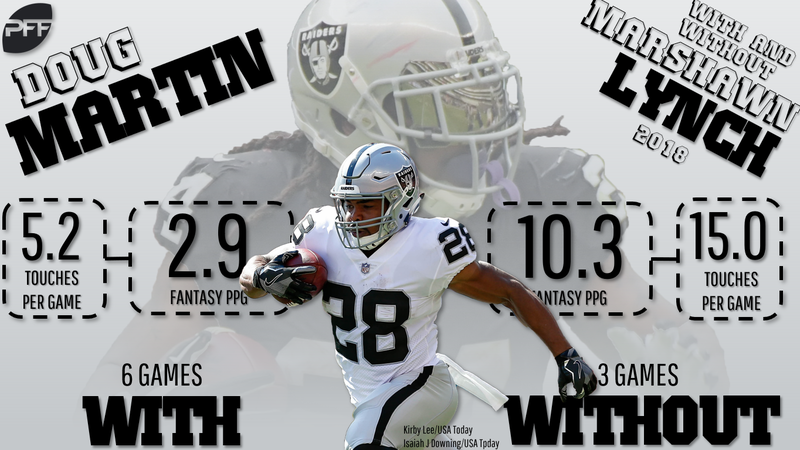 Martin is averaging 13.0 carries and 2.3 targets per game over his last three games (all blowout losses), with good efficiency (4.67 yards per carry). He’s a borderline RB2 this week, in a good matchup against the Cardinals. Arizona is giving up the most rushing fantasy points per game to opposing running backs. Eric Ebron has been stealing all of Doyle’s attention and touchdowns, but Doyle’s usage has been strong. He’s playing on 87% of the Colts’ snaps, while averaging 6.0 targets and 10.7 fantasy points per game. That’s good for, at least, low-end TE1 numbers. Miller has seen between six and seven targets in each of his last four games, and averages 13.2 fantasy points per game over this stretch (32nd-most). With Allen Robinson in shadow coverage against Xavier Rhodes and Taylor Gabriel‘s volume in decline, Miller makes sense as a fringe-WR3. If desperate for a spot start, Moore has a decent amount of upside this week. He’s seen at least five targets in four of his last five games and has our top WR/CB Matchup of the week.